Between a Rock and a Hard Place: What Are Ankara’s Options after Taking Over Afrin? On March 18, almost two months after the start of the Operation Olive Branch, the Ankara-backed Free Syrian Amy (FSA), together with the Turkish Army troops managed to completely take over Afrin in northern Syria, forcing the remaining Kurdish forces affiliated to People’s Protection Units (YPG) to retreat further to the east toward Manbij. 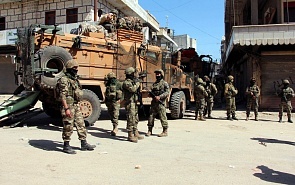 Since the very beginning of its new military adventure in Syria, the Turkish government had declared that its main goal is to secure the areas close to its borders in north-western parts of Aleppo province and to prevent the Kurdish groups – which are deemed by Turkey as terrorists – to consolidate their role in those areas. However, recent statements by the Turkish officials declaring their desire to extend the scope of their military operation further to the east, to Manbij, Ain el-Arab and even to the northern parts of Iraq, together with the recent footages of the Turkish soldiers raising Turkish flags at the top administrative buildings in Afrin after entering the city center, have sparked debates over Ankara’s real end goal, as well as its implications for Syria and the whole region. Generally speaking, by starting a military operation in northern Syria, and now by threatening to expand it further to the east, Turkey has been pursuing two main objectives: First, to provide itself with some tangible achievement on the ground, to be used as a bargaining chip in any upcoming political negotiations, so that Ankara would be able to preserve its influence in the future of Syria. Second, it seems that the Turkish leaders are trying to build upon the persistent chaos in Syria and Iraq to once and for all “solve” the threat they’ve been feeling over the Kurdish issue. As for the first objective, it could be said that the Afrin issue has already been in use by Turkey to gain diplomatic as well as geopolitical points from both its Western (mostly the US) and Eastern (Russia and Iran) partners. It seems, that in exchange for taking a green light from Iran and Russia for its military operation in Afrin, Turkey has agreed to turn a blind eye on the Syrian Army’s advances elsewhere, most recently in Eastern Ghouta. On the other hand, the Turkish officials have been consistently indicating their willingness to reach a deal with the US over the other Kurdish regions of Syria, mainly Manbij, presuming, that the US would expel YPG and other Kurdish militant elements from those areas and Turkey would accept not to expand the scope of its military operation. This is exactly where Ankara’s first and second objectives meet, and at the same time, cause an increasing confusion in Turkey’s total Syrian strategy. In other words, it seems that Turkey is more willing to put the burden of purging the remaining parts of Syria’s northern territories from the Kurdish groups on the shoulders of the United States and at the same time, consolidate its current position in Afrin for further use in the future. However, such a tactic appears to be a very hard task to do, as the US is obsessed with its own reservations regarding the Kurds. The US reservations derive mostly from the fact that after the collapse of Daesh’s (ISIS) so-called Caliphate in Iraq and Syria, the focus of the US Syrian policy has shifted from combating terrorism to containing Iran’s influence in the country. As such, Washington still needs to work closely with the Kurds, especially within the framework of Syrian Democratic Forces (SDF) to have an effective military force probably to be used against pro-Iran and pro-Syrian government forces. Given this priority, Washington would comply with Turkish demands about the Kurds only in case that Ankara agrees to distance itself from Iran-Russia axis in a meaningful way, putting an end to its current diplomatic cooperation with the two. However, given the deep, ever-increasing sense of mistrust among the Turkish officials toward the US over issues such as the American position of the failed 2016 coup in Turkey as well as Washington’s overwhelming reliance on the Kurds in fighting Daesh, Turkey is not ready to re-adjust it Syrian policy in line with the US interests. Meanwhile, if, given this distant nature of a compromise with the US over Manbij, Turkey decides to go it alone militarily to secure its interests in northern Syria, it would not only put the Turkish troops at risk of a direct clash with nearly 2000 American special forces stationed near Manbij, but also spark a potential backlash from Iran and Russia which are becoming more and more worried about the existence of a serious expansionist elements in Ankara’s agenda. Finally, one should keep in mind that retreating from Afrin does not necessarily mean that YPG has accepted a defeat, as it’s actually vowed to continue fighting against Turkey using new tactics, i.e. guerrilla warfare. In the same vein, going for a witch hunt further to the east could potentially radicalize even the moderate, non-militant Kurdish groups and mobilize Kurdish public opinion all over the region against Turkey, so that Ankara would be faced with an even more complicated dilemma with the Kurds both at home and abroad. The Afrin issue has already been in use by Turkey to gain diplomatic as well as geopolitical points from both its Western (mostly the US) and Eastern (Russia and Iran) partners.